Framingham is Now a City! 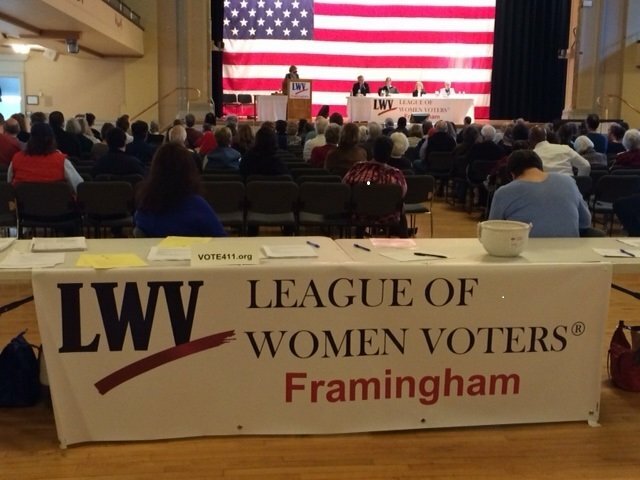 The League of Women Voters of Framingham is a nonpartisan grassroots organization. We encourage the informed and active participation of citizens in government, work to increase understanding of major public policy issues, and influence public policy through education and advocacy. For more information about the Framingham League, check out this interview featuring the Framingham president, Stephanie Deeley. On January 1, 2018, Framingham swore in its first Mayor and City Councilors. Our new form of government is now officially in control. The League of Women Voters in Framingham looks forward to watching the evolution of our form of government and encourages all residents to take part in this process. We will be looking for ways to help engage and inform Framingham residents. Join us at an upcoming meeting and give us your ideas. Democracy is not a spectator sport, so get involved! 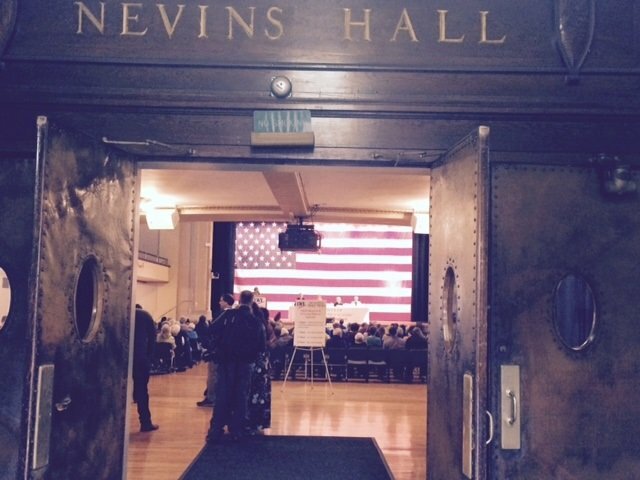 In May, we held 5 voter registration events, both at Keefe Tech and at Framingham High School. As a result of these events, we registered over 200 new voters! We also had a booth at Framingham’s Earth Day Event on April 28th, and registered a few new voters there also. We will be doing at least one more voter registration event this summer, so check back here for more information on when and where that will be happening. We will have a booth at a few of the Concerts on the Green on Friday nights starting on June 22nd where you can register to vote, join the League of Women Voters, or add your name to our email list. Stop by and let us know what ideas you may have for things we should be talking about here in Framingham. We are happy to announce we have done four shows for the Framingham LWV presents State of the City with great success. Our first show ran for 30 minutes, but we found that was simply not enough time so the following shows are all one hour long. To view these shows on line, use this link to access AF TV’s Video on Demand Service and type in State of the City. We will be taking the summer off but will be back with more episodes in September. On May 30th we held an Immigration Forum at BRACE in Framingham and invited panelists from several local organizations that work in the field of immigration. With us were Marion Davis from the Massachusetts Immigrant and Refugee Advocacy Coalition (MIRA), Diego Low and Martha Yager from MetroWest Immigrant Solidarity Network, Caryn Sigurdson, an attorney with the American Immigration Lawyers’ Association (AILA), New England Chapter and Chief Trask from the Framingham Police Department. It was a wonderful discussion with the audience fully engaged. As this is an issue of interest to many in Framingham, we plan to hold another of these events in the fall. On Monday, July 16th, the Framingham League of Women Voters partnered with MetroWest Daily News to hold an Informed Framingham event on Fake News. Panelists were Anne Brennan, editor of the MetroWest Daily News, Mike Beaudet, investigative reporter for Channel 5 in Boston and a Journalism Professor at Northeastern University, Burton Glass, Executive Director of New England Center for Investigative Reporting, and Aimee Reinhart from the Shorenstein Center at the Harvard Kennedy School of Government. Use this link to view a set of slides from the event that may be of interest. You can also view a Facebook Live recording of the event on Metrowest Daily News. Stay tuned for information on the Candidate Forum we are hosting on August 20th, and for information on our next Informed Framingham event! On September 4th, we will be voting in the preliminary election for two races that have more than one candidate. The Middlesex DA position has two contenders, and there will be write-in candidates to fill the 6th Middlesex Seat in the State House of Representatives. The Framingham League of Women Voters will hold a candidate forum on Monday, August 20th at the Costin Room at the Main Library from 7 – 8:45pm for both of these races. We will be reaching out to residents for questions and topics as the date gets closer, and will be publishing information on this event on our FaceBook page, as well as here, by mid-July. We hope you will join us for this important event. The General Election will take place on November 6th and the League will hold events related to this election starting in October. There are also several potential ballot questions that may appear on this ballot, and the League is planning to hold a forum (or forums) on these questions. Again, check back here and on our Facebook page for more information on these events. Click here for a brochure by the Framingham League of Women Voters on TDR (Transfer Development Rights). The Framingham League of Women voters invites you to join and be part of the conversation. The League of Women Voters here in Framingham is playing an active role in informing and engaging residents in the processes that impact all residents. We hold voter registration events, Informed Framingham events on topics of interest to our community, and encourage non-partisan discussions on issues of importance to the City. You can be part of this process simply be becoming a member. To become a member online click here or download a paper application to send in by mail. Already a member? Click here to renew your annual membership. Thank you for your support of the League of Women Voters of Framingham. Giving to the League of Women Voters continues the mission to promote citizens’ active involvement in our democracy. Support the Framingham League’s advocacy and lobbying on issues. A gift of this kind is not tax-deductible. Click here to donate. Give to the Framingham League’s Citizen Education Fund to support civic education and voter service. A gift of this kind is tax-deductible. Click here to donate.